“BOB’S BURGERS” follows a third-generation restaurateur, Bob Belcher who runs Bob's Burgers with the help of his wife and their three kids. Despite his greasy counters, lousy location and occasionally spotty service, Bob is convinced his burgers speak for themselves. 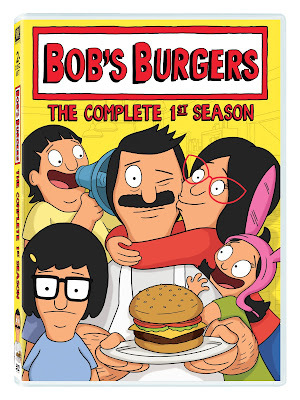 Featuring the voice talents of H. Jon Benjamin (“Archer”) and Kristen Schaal (“Flight of the Concords”), “Bob’s Burgers” is a hilarious comedy about one unconventional family that will have you coming back for seconds. We had the opportunity to review Bob's Burgers Season One. We'd heard of this a few months back and saw a couple of the commercials, but never got to sit down and actually watch it. So when we finally got it in the mail, the hubby was pretty excited to see it, he heard it was funny and although put in the same category, nothing like Family Guy or American Dad. Well, after watching it this past weekend although it's a complete different setting then both American Dad and Family Guy, I still saw similarities in the series. A family with three kids, the humor, etc. My husband was not impressed by this series. I did enjoy some of the episodes in season one more then others, there were times where I laughed out loud and other times where I thought the characters/episodes were trying too hard, but that's just in my opinion. If you're a fan of Family Guy or American Dad, I'd recommend this series, though it might not be as funny as the other two popular series it does have a few moments that get you. Disclosure: All opinions are my own. I received Bob's Burger Season One at no cost for the purpose of this review. No other compensation was received.